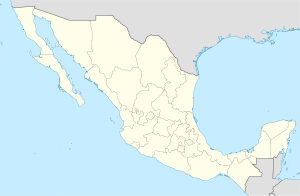 Temascalapa is a town and municipality seat in Mexico State in Mexico. It is located to the north of Mexico City and to the west of the municipality. It is situated close to the border with the state of Hidalgo, and connected with the city of Tizayuca by land. This locality was formerly known as San Francisco Temascalapa. The municipality covers an area of 168.26 km². As of 2005, the municipality had a total population of 33,063. The region is noted for drug cartel activity after the death of Netflix's location scout, Carlos Muñoz Portal, for the TV Series Narcos: Mexico, who was found dead with multiple gunshot wounds in his car on September 15, 2017. ^ "Temascalapa". Enciclopedia de los Municipios de México. Instituto Nacional para el Federalismo y el Desarrollo Municipal. Archived from the original on June 22, 2014. Retrieved August 21, 2011.